just got an F2, looking to fix it up! 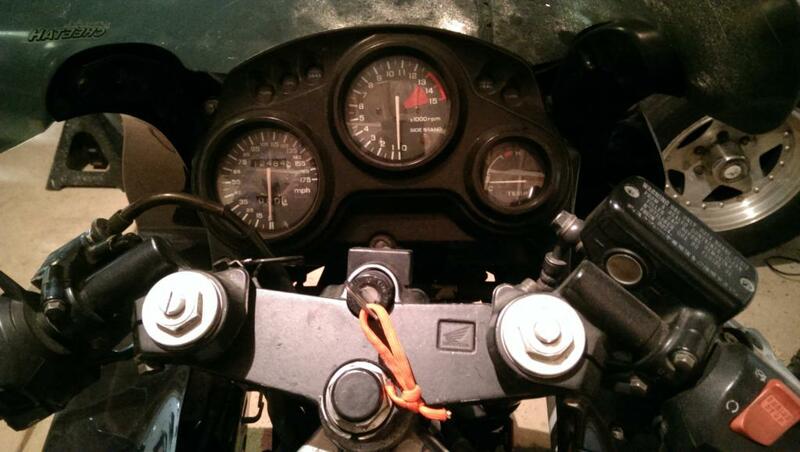 I'm waiting on fork seals and a choke needle from fleabay (one of them was snapped off). I plan to put it all back together, clean/lube the chain thoroughly and sort out the saggy rear spring and see how it rides. The tires are a bit old and hard so I plan to get a set of cheap race take-offs for it in the mean time. I've found a few improvised bolts here and there that will need replacing, a little paint touch up and it's missing the centerstand - anyone have one they wanna unload?? - but over all I'm thinking this will make a cheap hassle free runner to zip around on. Pic of the garage... as you can see it's starting to get cramped w/ too many projects!! Wanna take better pics of that can? Curious to know where it's from. I'd got a spare C-stand but the carriage would kill the idea to send it... if you absolutely cannot find one, which I doubdt, gimme a PM and I'll wrap mine up. Last edited by Mattson; 11-27-2014 at 11:32 PM. Its not missing the center stand, they didnt come from the factory with one, that was a dealer add on. Also I wouldnt waste money on race take-offs. Race tires only work properly in a specific temperature. You wouldnt be able to keep them hot enough on the street. Street tire work way better on the street, and track tire work way better on the track (as long as your fast enough to get and keep the heat in them) Dunlop Q2 and the new Q3 would be a great street tire for aggressive street riding and they work pretty dam good on the track also until you go fast enough for track tires because to the street tires over heat on the track, when your fast enough for track tires. Oh, I almost forgot, sharp looking bike. ^ that, and I'm told that you only get about a couple thousand miles off them of course depending on the starting condition. Well good to know on the tires, I know a few folk around here that run them on the street just because they're cheap. For that they're ok, I mean they're rubber and hold air! I've never done it, my 1kF has PR3s on it and I like them. 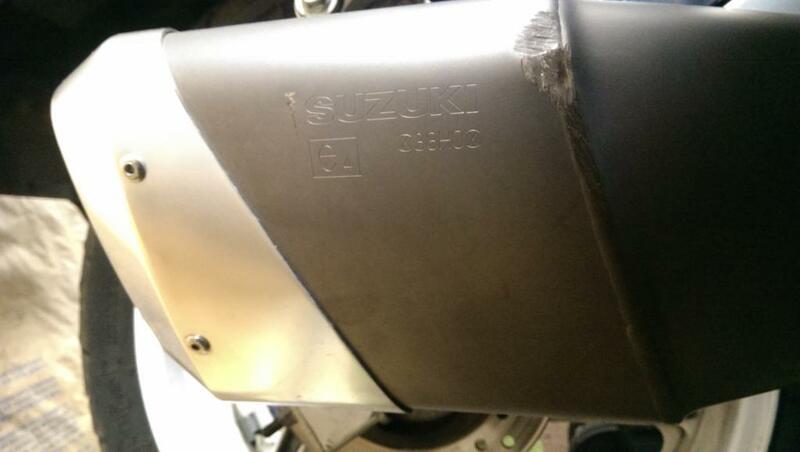 The can is off a newer Suzuki, unfortunately the PO had no idea what model. It fits perfectly though and sounds great, real throaty but not loud which is important for me. As far as keep or flip I haven't decided. Once I get it all sorted I'll start putting miles on it and see. 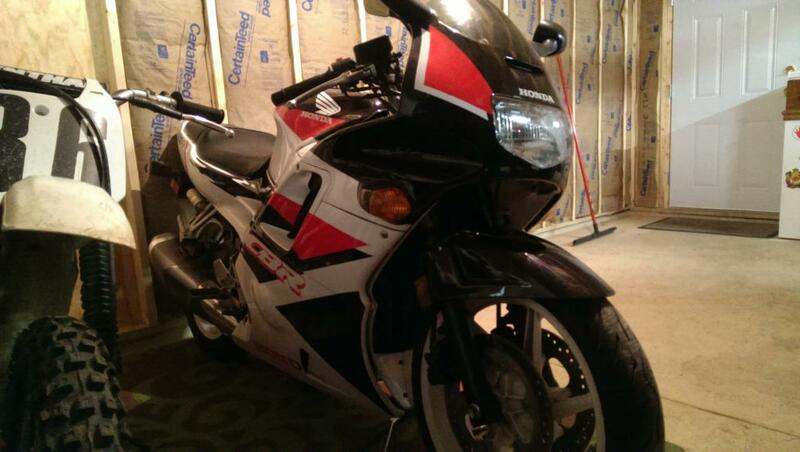 I only had $1200 in the bike I traded for this one and I haven't spent more than $40 on it yet. 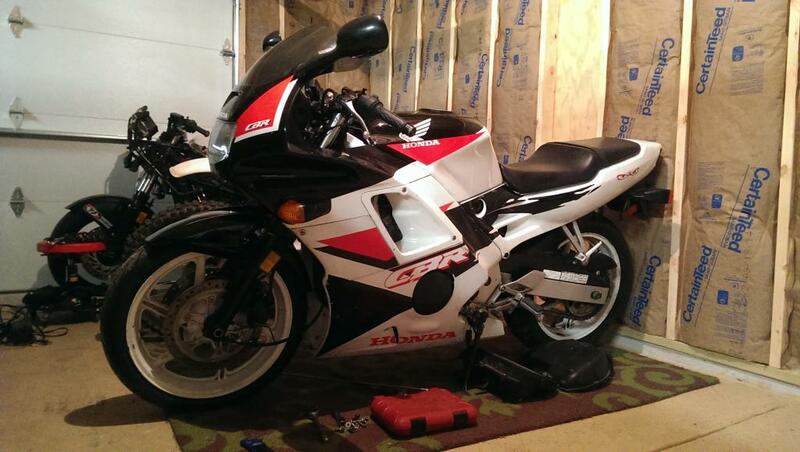 I figure I can ride it, sell it in the Spring or trade it off for a new Honda. I have friends at the dealership up the street so I could get a sweet deal on a new bike if I really wanted. Honestly I like this one though so we'll see what happens. Seems to be a gsxr 600/750 muffler. Good fit and finish and sounds good... who knew! Very nice, Drewski, good luck with the work! That's a great looking F2 and with low miles too. A very nice find. that muffler is from a 2008/09 gsxr 600/750.. VERY NICE... did you put the 94 body work on it ?